I wanted something to sink my teeth into on just how large IPV6 really is. As such, I decided to do it graphically. Initially, this meant just representing each IP address with a single pixel. Surely, the images would be doable. However, as I started crunching the numbers, they were much larger than I thought, and I came to a very quick realization that this wouldn't be possible. I needed to do some compression if I wanted to show it visually. So, I took advantage of compression where possible, and I let your imagination work in a couple spots where even compression won't turn out anything reliable or representational. To start, it's well known that we're running out of IPv4 addresses. IPv4 only address 2^32 possible IPs, which is 4,294,967,296. There are already 6.5 billion in the world, so we don't even have enough IPs for 1 per person. Given the fact that many of us have more than 1 (Internet, cell phones, cable/satellite TV) and many businesses have gobbled up millions at a time, such as IBM and Sun Microsystems, we're in trouble. It's estimated that we'll be out of IPv4 addresses within the next 2 years. There are things we can do to extend that life, but for the most part, it's time to move on to IPv6. To give a visual of how much of the space is left, consider the image below. 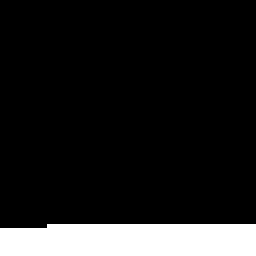 This first image is 256x256 pixels, for a total of 65,536 pixels. As already mentioned, there are currently 4,294,967,296 possible IPv4 addresses. As such, each pixel in my image represents 256 unique IPv4 addresses. There are currently only 511 million addresses left, or about 12%. My graphic below gives an accurate representation of the exhaustion, if black is all the used addresses and white is what is available. Now, what about IPv6? Well, to start, it addresses 2^128 possible IPs, which is 340,282,366,920,938,463,463,374,607,431,768,211,456 possible addresses. There are a lot of technical points of interest with IPv6. First, it is NOT backwards compatible with IPv4, which means we'll be living a dual IP stack for some time. Second, 64-bits of the 128 in IPv6 are dedicated to your Ethernet hardware address, commonly referred to as the MAC address. Which means, that your ISP could give you the other 2^64, or 18,446,744,073,709,551,616 unique IP addresses when you sign up for an account. After all, as you'll see, we have more than enough room. This number may not look large, but I want to put it into perspective visually, so you have an idea of what we're looking at. If each IP was a single pixel, this would produce an image 18,446,744,073,709,551,616 pixels square. Now, my monitor has the capability of showing 105 pixels per linear inch. This means my monitor would need to be 2,772,778,991,358 miles in length and width if I wanted to see the image without any scrolling. Just for comparison, a light year is 5,865,696,000,000 miles. It would take almost 6 months traveling at the speed of light to start from one end of my monitor to reach the opposite. Want an image to wrap your mind around it? 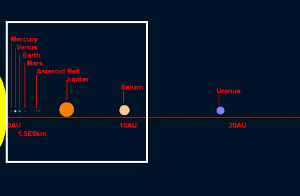 The maximum distance of Pluto from our Sun is approximately 4,557,000,000 miles away. We need to do that distance about 600 times before reaching the end of my monitor. We're still well within the Milky Way however. Let's get closer though. If I were to keep the same allocation of 256 IP addresses for a single pixel, as I did with my first image, then I would need a monitor capable of showing 72,057,594,037,927,936 pixels square. A linear distance of that size is about 1,083,116,793 miles across. This is slightly more doable as a visual representation. The distance from our Sun to Saturn is roughly 886 million miles. So, drive about 200 million miles further, long before we reach Uranus and we'll reach the edge of my monitor. Want a visual representation to scale? The yellow blob on the far left, just outside the white monitor is our Sun. The pink dot on the far right just inside the monitor is Saturn. Remember, this is our monitor size if each pixel on my monitor was 256 IP addresses. Certainly, this is much too large. Can't I get a monitor to fit on my desk? Let's allocate the entire IPv4 space to a singe pixel on my screen. This should give us a more manageable image, no? That means that I would need an image size of 4,294,967,296 pixels square. An image of this size would require a monitor width of only 645 miles. 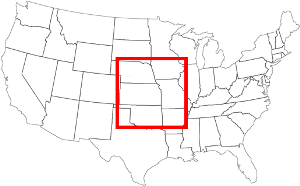 Putting the center of the monitor in the center of the United States, and I can see that my monitor is large enough to cover 6 states in the Midwest- Nebraska, Iowa, Missouri, Kansas, Oklahoma and Arkansas. Again, remember that each pixel in my monitor would be occupying 4.2 billion IP addresses. Think any hardware manufacturer is willing to make a monitor this large for me? So, there you have it. A visual representation of IPV6 as best as I could do. Hopefully, this will help you understand just how large IPv6 is, and that I don't expect us to run out of addresses with that vast number. Unless, of course, we enter inter-galactic communication on the same protocol. Posted by Aaron Toponce on Sunday, March 8, 2009, at 10:39 pm. Filed under General. Follow any responses to this post with its comments RSS feed. You can post a comment or trackback from your blog. For IM, Email or Microblogs, here is the Shortlink. A professor I worked for in college (in the 90s!) explained IPv6 like this: "It's large enough for every lightswitch in every home to have its own public IP address." I managed to Digg this here: http://digg.com/linux_unix/The_sheer_size_of_IPv6. Great article. We have been running out of IPv4 addresses since 1998. The solutions employed then to expand the address space are still valid and could expand the use of IPv4 well beyond 10 years. The real problem with IPv6 has been and still is compatibility. There were other ways to expand the address space while remaining much more compatible with IPv4 (by reshuffling some bits in the IPv4 header). The IETF made the choice of IPv6 over other compatible options and consequently we are still using IPv4 11 years after the standard has been adopted. As you point out 2^128 is a unimaginably huge number, it is in fact much larger than what humanity will need for the next one million years. It probably could address all hosts in the entire universe if we accounted for thousands of extraterrestrial intelligent civilizations. But then IP would probably not be the solution anyway, imaging the retransmission of a packet lost across 4 light years (the distance to our closest star). It has been only a year since ICANN/IANA has finally enabled IPv6 into root DNS servers. Eventually ISPs will move to IPv6 but very gradually and I bet there will still be IPv4 hosts for well over 20 years. It’s estimated that we’ll be out of IPv4 addresses within the next 2 years. Doesn't really help your argument at all, as we've been hearing this for a dozen years now. IPng anyone? There's a typo. "the our Sun"
It looks like the purple dot is Uranus. Saturn is the yellow dot that comes after the big orange Jupiter. You're right. It was late when I made the image, so I must not have been thinking clearly. Thanks. Your comment about the IPv4 image is wrong. IPv4 is 2^32, dropping 2^16 (2^8 * 2^8 image) leaves 2^16 IP's per pixel, or a /16, 64k IP's per pixel. When I tried to get redundant routing from two separate ISPs, I learned that no public ISP routes less than a /24 and many don't route less than a /22. I don't understand the advantage to IPv6 until there is routing for /48 - and I haven't seen that discussed. What's the point to having an address if no one can discover how to get there? Wouldn't IPV5 have been sufficient? Does the solar system representation then count? I'm sorry you're bothered with using technology that is 8 years old, when it's been replaced two times over. Maybe you should pressure your corporation (not "coroporation"- another reason you should be using an up-to-date browser- spell check is a good thing) into updating the policy to allow at least IE7 or IE8 or some other browser, like Firefox or Chrome. I've thought about it, and I don't want to support IE6 users visiting this site. So, either don't visit my site with IE6 or use a different browser. After all, I didn't force you here. You came here on your own. You're more than welcome to leave. I’m sorry you’re bothered with using technology that is 8 years old, when it’s been replaced two times over. Maybe you should pressure your corporation (not “coroporation”- another reason you should be using an up-to-date browser- spell check is a good thing) into updating the policy to allow at least IE7 or IE8 or some other browser, like Firefox or Chrome. When I tried to get redundant routing from two separate ISPs, I learned that no public ISP routes less than a /24 and many don’t route less than a /22. I don’t understand the advantage to IPv6 until there is routing for /48 – and I haven’t seen that discussed. What’s the point to having an address if no one can discover how to get there? This is fascinating! It shows the inherent difficulties of representing data sets containing both extremely small and extremely large data values in a visual manner. Of course, you could show the data logarithmically, but many people do not as readily readily grasp the relationships of the data elements when shown that way. I think IPV4 will be around for a long time, since NAT provides a way to "hide" the real IPV4 addresses behind routers. Technologies often seem to live on well past their prime, simply due to the investments that have been made in them, and the costs of switching to a newer, better technology. As Julien @14 and mamou @17 pointed out, there are a few errors in Aaron's math. In the next paragrph (P 7), if we allocate an entire IPv4 address space per pixel, we'd need a monitor that was 2^48 = 281,474,976,710,656 pixels on a side (Aaron's value is off by a factor of 4096). That monitor, at Aaron's pixel density woul still have to be ~42.3 million miles on a side - about the distance from Mercury to the sun. For Aaron's "six-state" monitor illustrated in the third image, each pixel would need to represent 2^64 (~18.4 quintillion) IP addresses, not the 2^32 (~4.3 billion) that Aaron suggests. With these corrections, this still makes an awesome visualization of the vastness of IPv6 space. IPv4 was developed in 1974-75 out of a need for a universal addressing system for global routing. Back then smart phones, wireless laptops, and even PCs did not exist. (The microprocessor chip had just been invented 2 years earlier, and the very first microcomputer kits, like the Altair 8080 were just coming into existence; but these were more “geek toys” than practical computing or networking devices.) Computers were big, monstrous devices that took up large rooms – or at least large closets – and cost tens- or hundreds of thousands of dollars. Only large corporations and universities had computers, and only a small percentage of their employees knew how to operate them. In that environment, 4.3 billion addresses seemed like a virtually unlimited supply. I’m not sure of the exact figure, but I’m guessing that there were less than 100,000 computers (or at most a few hundred thousand) in the entire world at that time. So the designers of IP were not concerned with address space efficiency and designed the classful system that only allowed for three sizes of networks; class C (254 hosts or smaller), class B (up to 65,534 hosts), and class A (up to 16,777,214 hosts). At the time, they anticipated that the vast majority of network address requests would be for class C. The classful addressing system allowed for 126 class A, 16,384 class B, and just over 2 million class C networks in total. When IBM introduced the PC in 1981, they legitimized the microcomputer as both a business tool and as a networking device. With the PC boom came a significant increase in the rate of requests for class B networks. Organizations came to realize that with a PC on every desktop, networks capable of supporting only ~250 host devices would not be large enough to accommodate future growth. This is when the “IP engineers” started to worry about the limits of the IPv4 address space. It was not that they would run out of IP *addresses* per se, but rather that they would run out of IP *networks* - specifically class B networks – by the early 1990’s. Once the 16 thousand class B networks were allocated, we could start giving organizations class A networks, but with only about 100 of them, that would not last long. The first significant “address stretching” solution introduced in the mid-1980’s was subnetting, and was later refined with Classless Inter-Domain Routing (CIDR) and Variable Length Subnet Masking (VLSM). This allowed organizations to divide larger class B and class A networks into smaller subnets and allocate only the portion of a classful network that an organization needed. Combined with re-claiming unused address space from previously-deployed class B and class A networks, this eased the address crunch. In 1991-92, the World Wide Web was introduced. HTTP gave a user-friendly interface to the previously “geeky” Internet. This, combined with increased accessibility through service providers like CompuServe, AOL, and MSN, again accelerated the rate of IP address allocation. It was estimated that somewhere around the turn of the millennium we would run out of IP address space. Another pair of “stretching” solutions – private addressing and Network Address Translation (NAT) – eased the crisis. Using private IP addresses locally and NAT for global services, a local network could have hundreds or even thousands of devices sharing only a few or even one global IP address. Instead of end-organizations being separate networks on the global Internet, each was simply a node (or a few nodes) on the service provider’s network. The widespread adoption of private addressing and NAT forestalled IPv4 address exhaustion into the 21st century. Still, each new customer required at least one global IP address, and the number of global addresses was starting to run very low. The most recent surge in IP address allocation came in the first decade of the new millennia. The popularity of mobile devices – wireless laptops and more recently smartphones – have again accelerated the consumption of IP addresses. On January 31 of this year (2011), IANA – the international “keeper of the IP addresses” – allocated the last blocks of IPv4 address space to APNIC, the Asia/Pacific regional Internet registry. As the regional registries allocate their remaining addresses to ISPs, they cannot replenish their stores. As the ISPs assign those remaining addresses to their customers, they, too will not be able to replenish. Once they’re out – that’s it. Nada. Nil. Over. Done. The bottom line – while we’ve done a remarkable job in keeping this 37-year-old technology running this long (kind of like my grandfather’s 1967 Mustang), we are now at the point where it is beyond repair and it is time to replace it with a new, bigger, and better Internet Protocol. p.s. As to Jorge @16’s question about IPv5, there was an experimental protocol (Internet Stream Protocol, or ST) developed in the late 1970’s that was dubbed “IP version 5” (ca. 1994). Its intention was to create a protocol that would better handle virtual circuits and streaming data. It was never widely deployed, and has since been replaced by better protocols like Asynchronous Transfer Mode (ATM). More to the point; ST (or IPv5, if you will) did not create a new addressing system – it used IPv4’s addressing scheme and therefore is/would be in the same predicament. The math checks out fine. Another way of thinking about it is how many addresses can be assigned for each gram of mass on earth. 56 billion addresses per GRAM of matter on earth! Another motivation. More and more apps imbed the users IP address somewhere deeper in the packet than the Network layer. While there are plenty of Application Gateways to do the translation, each time we translate, the dialogue is delayed and departs from optimum. Oh and operationally, there is a motivation - you can do away with NAT and Application Gateways if you use IPv6. Too bad there is no killer app yet, that would accelerate the migration. Growing IPv4 with NAT is a bad solution, and there's nothing wrong with moving on past a 30 year old protocol. IPv4 has about 6 billion addresses, significantly fewer actually usable. 7 Billion people. Plus how many devices in their homes and workplaces? Sure, you can NAT that, 100 billion devices even. But how are you going to make a reliable Skype connection when you're 3 NATs deep at your home and your friend is 5 NATS deep in China? It can be made to work, but ask any anyone in the business if an entire planet in a NAT mess like that wouldn't be severely dysfunctional. The cost of that vs deploying IPv6 and letting IPv4 go the way of IPX/SPX is far cheaper. IPv4 only hands out 4.2 billion addresses, not 6 billion. It's a 32-bit addressing space. ish that these 2 terms mean 2 different things. In reality what you mean to explain is that each PIXEL SIDE represents 256 addresses, so each PIXEL represents 256*256 = 65,536 addresses. I really like the representation of how big IPv6 is: IPv6 Size. It's an interactive graphic (the yellow and green squares are buttons) that lets you zoom in and out of the space.